I was standing on the train tracks when out of the blue a voice called out. I just looked at him and burst out belly laughing, harder than I had in a long time. The on-duty police arrived. My life-saver handed over what had happened and told them to make sure I get all the help I needed. He walked me to the police car and as we parted ways he told me to stay safe. I still remember the day my wife, Mel, told me she was pregnant. It was October 2012. We had been married the June before and had just returned from our honeymoon. We had only been trying for a baby for a few months so I was shocked – but excited – that we had succeeded so quickly. Only a few weeks before we had been riding roller coasters in Blackpool and now we were starting on our own roller coaster. Little did we know bumpy this ride was going to be. The next nine months were quite routine. We had the two scans and at 28 weeks I had knee surgery so I was stuck at home, giving me time to prepare the nursery. We found out that we were having a girl; we chose the name Elizabeth-Ann Letitia. Elizabeth-Ann was a dedication to both of our nans who had passed away. Although the pregnancy was as routine as can be, my anxiety was getting the better of me; I wasn’t worried about being a dad, in fact, I was looking forward to that, I feared losing the baby during pregnancy. It was something I just couldn’t shake out of my head. The birth itself wasn’t as straight-forward as we would have liked. After a few false starts, Elizabeth came out with her shoulder stuck and the trauma team had to be rushed in. But then I was holding her in my arms and I was the happiest man in the world. We had been told that Mum and baby had to spend 24 hours in hospital for observation. There wasn’t a bed for me. I was told mum and baby needed rest. “What? I’m the child’s dad; how can I not be able to stay and help with Elizabeth on the first night?” I thought. I was holding her in my arms and I was the happiest man in the world. I left the hospital down-hearted. Maybe I was being selfish but all I felt was anger at not being there for her first night, her first-night wake-up, first nappy and whatever else. The next day I was up at the crack of dawn and back to the hospital. After a stressful day of being shown how to change a nappy and bathe the baby and signing paperwork, we took our baby home, the happiest parents alive. Things would remain relatively normal for the first few weeks; I was changing nappies during the day and Mel was doing it when she woke to feed. Mel was breastfeeding so she was doing all the feeding. We had several visits in the first two weeks – family and friends as well as health care professionals – so there wasn’t much time with just three of us or, indeed, time to process everything. I returned to work after two weeks. I soon found I was having less and less time with Elizabeth; she needed Mel more than me of a night, settled better on her than me and I was spending so much time at work. I felt as though there was very little Elizabeth needed me for. I kept thinking that my feelings would change. My feelings – or should I say lack of feelings – for Elizabeth didn’t present themselves all at once; they crept up on me slowly. The first time I thought “maybe something is wrong here” came while we were in Liverpool visiting my family. We had decided to have a three-week break so we could see as much of my family as possible, and to give us a little more time together. I was hoping to build more of a bond and Elizabeth would start to rely on me more. My family were so excited to have Elizabeth with them that they would often take her off us to “give us a break” or “help us out”. I didn’t want to tell them to stop helping as I knew they would only see us a few times a year so would want to make the most of the time with Elizabeth. It was frustrating though; it was stopping me from bonding and doing more to help and it led to a couple of fights with my family. Eventually, I told my family that I was feeling down and that I thought I had the baby blues or maybe I was just being a jealous dad; at that point in time I didn’t know. I knew I had a duty of care to look after this child in my arms, but that’s was all it was: a duty. One night I looked down at Elizabeth and felt numb; I thought to myself, “Who’s baby is this I am holding?” I felt no love, no happiness and no pride. I knew I had a duty of care to look after this child in my arms, but that’s was all it was: a duty. I didn’t care or feel anything for her. It was her fault I felt like this and without her I would be normal. The more I felt like this the more I hated myself for having these feelings. My thoughts got worse; I was hating myself more and more. 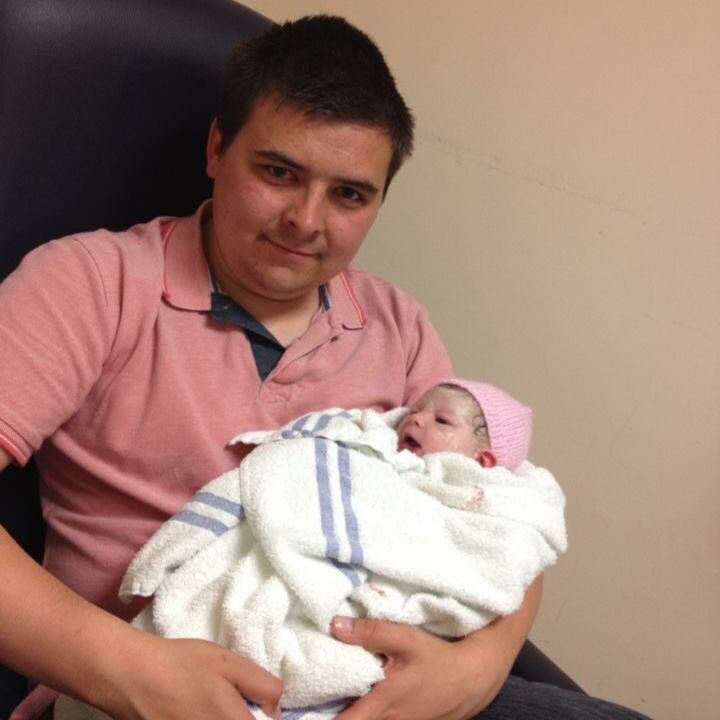 I couldn’t understand how I had so quickly gone from a proud, loving dad holding his minute-old girl in his arms, to a dad who could have been looking after someone else’s baby. When Elizabeth was five months I was signed off work. I was a failure; I couldn’t work and couldn’t support my family. My doctor got in touch with the mental health crisis team who decided I should be admitted to hospital for my safety and to get support. I wasn’t happy but I knew it was for my own good. I was put on some strong medication that included powerful sleeping tablets as I was having massive anxiety attacks of a night. It left me feeling sleepy all the time. When I wasn’t sleeping, I was in hospital having cognitive behaviour therapy. My wife had control over my meds; I had no control over my own life. When I wasn’t sleeping or at hospital I was trying hard to put what I spoke about in therapy into action: trying to be a husband, trying to be a dad. When things got bad I had sedatives to relax me and calm me down. But I was in hospital so much that I was missing things with Elizabeth; she was bonding with her mum and didn’t need her worthless, rubbish dad. These were the thoughts going through my head. In January, when Elizabeth was eight months, I’d had enough. I got up out of bed and walked down the stairs, past my wife and out of the door. I was going for a walk. In my head this was my last walk: I was walking to my death; walking to take my life. I called Mel to say goodbye; I told her I was sorry I wasn’t the person I should be and that she was better without me. I asked her to look after Elizabeth and remember me. I hung up and stepped off the platform on to the tracks and started waiting for a train to take this pain away. The off-duty policeman had saved my life and I was sitting in the back of a police car, being taken to the hospital. I was being taken somewhere I didn’t want to go. I was angry. Now I was being forced to go to hospital and talk about my problems. It’s my life, I thought, I should have control over ending it. We arrived at the hospital. The officers were not allowed to leave me until I had been seen by the psychiatrist and admitted fully. After a frustrating wait, the psychiatrist and crisis team came and the police departed. I was asked why I wanted to take my own life; they explained how I have so much to live for. I lost my temper: I explained how the things they said I had to live for were the reasons I wanted to take my life, and I was fed up of people telling me it will get better yet denying me the help I needed. I knew I had PND symptoms and had been telling health professionals this for months yet all they did was keep pumping me with meds and were not looking at how to help me as a person. 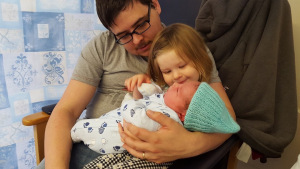 This was the first time I felt a stigma around being a man with postnatal depression; my own mental health team were telling me it was unlikely I had PND as it was not commonly known in men, despite my knowing otherwise. “You’ve just got a bit of the baby blues”, they said. The more they said this the angrier I became. I was just not being believed. Eventually, they opted for a treatment plan of more cognitive behaviour therapy as well as counselling that explored my detachment to my daughter. I was told that the nearest NHS bed was in a unit in Manchester so they didn’t want to admit me as being that far from my family and support network would be damaging to my recovery. Instead, I would be going home and coming into hospital for treatment in the day. I was walked home by one of the team who was there to make sure I wasn’t alone and that I got home safe. I got home and Mel wrapped her arms around me and we both just cried. It was at this point Elizabeth did something she had never done before: she pushed away from Mel and put her arms around me. Then she fell asleep in my arms. Something happened that night: a little flame in my heart was lit; it was a small flicker of love, sure, and it needed a lot of careful looking after, but it was love nonetheless. It was something I never thought I would feel again, and I never believed it would be Elizabeth who would make me feel love again. I knew if I wanted to get better I was going to have to do it myself. Mel and I sat down and talked for the first time in ages, and I mean a proper talk; it poured out of me like I tap. We spoke about how my feelings had changed, what the hospital were or were not doing to help and what we could do at home to me get that bond back with Elizabeth. I researched PND at length; looking at how women are advised to build bonds with their children, and after having many health professionals urging to me to do so, I also joined a PND support group. I promised myself to give it a go, but I really struggled as I was the only man in the group and couldn’t communicate with the mothers. The one time I told the group I was struggling to bond with Elizabeth I was shot down: I wasn’t the one who’d had to push something the size of a watermelon out of something the size of an orange. I was even told I was just jealous because I was no longer the number one priority in my wife’s life. I was even told I was just jealous because I was no longer the number one priority in my wife’s life. But it was through this group that I found out about baby massages. One of the male workers could see I was struggling and afterwards told me about a PND group that teaches baby massage and how it might be good for me. He told me that the group aims at teaching people ways of how best to relax their children using massage. For me this was the one thing I looked forward to each week; it was a time where I could talk to someone and spend some relaxing time with Elizabeth. Over the next few months, I started to do more and more for Elizabeth. I started to have one bath a week with her. Mel was also expressing at this point, meaning I could do more feeds and Elizabeth could learn to come to dad as well as mum for help. We also started to go swimming together every Sunday which gained us even more trust and love for each other. We became a team and a family once more. I am not going to say I didn’t have bad days – the next six months were very much up and down – but the more I kept doing the more I gained my love and affection for Elizabeth back. I was about three months without a low when Mel told me some news that could have tipped me either way: I was going to be a dad again. Andrew’s birth, in October 2015, was not an easy one; it was more traumatic than Elizabeth’s yet I think I coped a lot better. Mel wasn’t coping as well as she did with Elizabeth and I really wasn’t ready to see her in so much pain. I will never take away from a women’s pain; it is 100 times worse than any pain I could feel and I will never take that experience away from Mel. A man’s pain is psychological: we see our partners screaming, begging for it to be over, on gas and air and wanting something stronger yet still being in pain; it can lead us to feel helpless at not being able to help. We were close to requiring a C-Section but luckily Andrew got his act together and things began to move. Due to his being distressed Andrew swallowed a lot of meconium, so he required suction to clear his airway and breath for himself; we had to wait several anxious minutes to hear him cry and to be able to hold him. I now know techniques I can use to help me bond and ultimately get me out of my low. Once he was in my arms all the stress, the anxiety and the worry just faded away. I was once again not able to stay in the hospital for Andrew’s first night but that was OK: this time I had Elizabeth to look after. And so, our life with two began. Things haven’t been half as bad as with Elizabeth. I am still on medication to help my PND and I still have very low days; the difference is that my lows are further apart and I now know techniques I can use to help me bond and ultimately get me out of my low. And in the times when I’ve struggled with Andrew – he would only feed off Mel and he hated the water so I wasn’t able to swim with him to build a bond – Elizabeth was always there to take my attention, giving me something to focus on, and serving as a reminder that things get better. Tony Crone is the founder of PND Daddies. You can read more of his story on his blog, The PND Daddy.